PORT MOODY, BC – Twin Sails Brewing has announced the release of a limited edition beer brewed in collaboration with Coalesce Brewing, an independent project of Twin Sails head brewer Ryan Voigt and his partner Adrienne Cafe. This is a mixed fermentation ale that we feel showcases the epitome of what our two companies represent. The use of Coalesce’s carefully curated Foreword Reserve culture showcases the fundamentals of the care and attention that goes into every aspect of designing a beer with the end state in mind, and the massive raspberry addition defines our nature of trying to push the boundaries of how much flavour we can put into a beer. We aged the beer in Chardonnay oak barrels for 1 year then transferred it onto near equal parts raspberries to secondary ferment for an additional 2 months. It was then bottled and allowed to naturally carbonate and condition for 3 more months. The massive fruit addition makes this beer the definition of “jammy”. Expect full raspberries up front with a strong funk and bright acidity. This beer will be great enjoyed now, or cellared to allow for more of the brett characteristic to further develop. 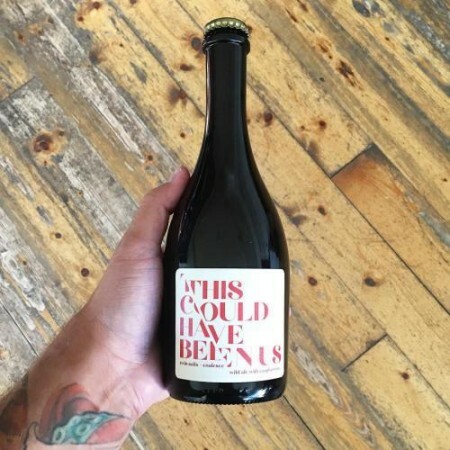 This Could Have Been Us was released at Twin Sails this past weekend, and is available in a limited run of bottles and on tap while supplies last.